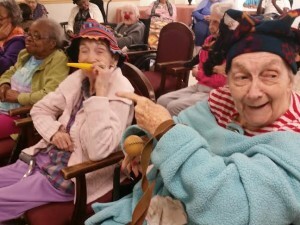 Sing and Play Along workshop for Elders: The interactive play and sing along performance includes well known folk and popular songs from the 40s, 50s and 60s, as well as innovative therapeutic play exercises, which I weave through out the performance. We begin with light warm up exercises and simple connection. I then share percussion instruments and fun costumes with volunteers from the audience. 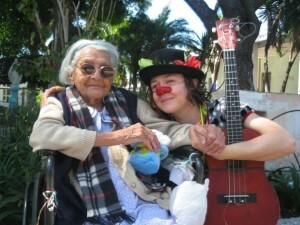 Together we play songs and enjoy interactive music, therapeutic movement, spontaneous song share and fun simple games. Details and Special offerings: A typical program last 45 minutes-1.25 hours. I offer room to room visits for residents who cannot make it to the show. I prefer doing room to room as part of my programs, as I’d like to reach those people especially. I can do home visits and personalized concerts. 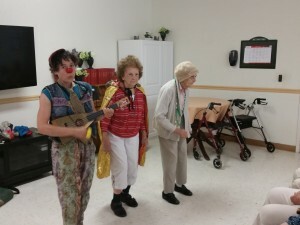 I also work with youth and volunteers on occasion, to bring more life and connection and community arts to assisted living facilities. Talk to me about creating a special program catered to the needs and desires of your residents! I typically ask for a sliding scale of $75-$300 per performance. Pricing is adjustable based on facility budget, Grant Program Participation and block booking prices and travel expenses. Ask me about the Dementia Society of America Grant to get up to $100.00 reimbursement for my fee.